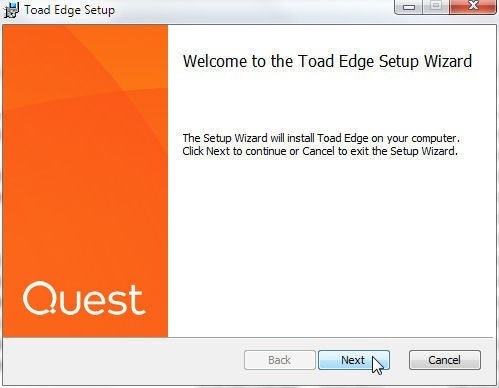 Toad Edge,Toad Edge 1.0 is the latest offering from Quest Software. 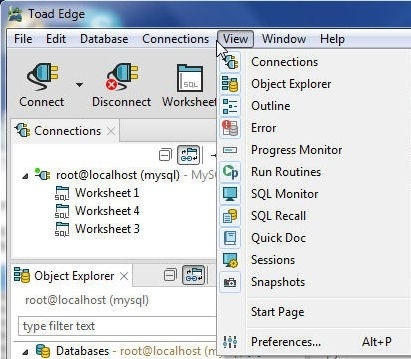 Toad Edge is a lightweight and flexible one-stop toolset for open source databases with initial support for MySQL Database, and designed for all the development and management needs of a DBA. 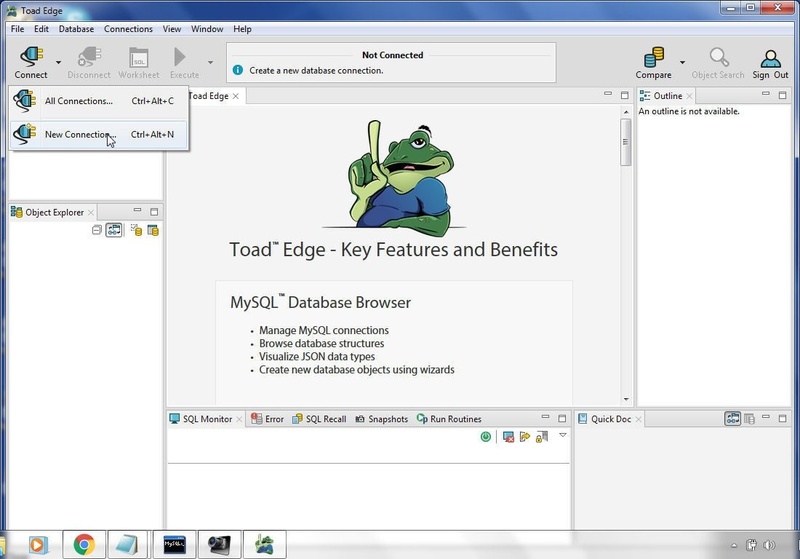 Toad Edge adds support for several features not provided by TOAD for MySQL. Some of the features unique to Toad Edge are support for MySQL 5.7.x, support for Mac OS X, support for JSON with data types and data editor, support for MySQL events, advanced user privilege management, statement run from/to a specification position in a SQL script, SQL diffs and object timestamp-based comparison with detailed schema compare reports, database and filesystem comparison, support for file system synchronization, DevOps features such as team collaboration, CI/CD, Jenkins and automation. In this article we shall test drive Toad Edge Preview 1.0. Some of the features, such as DevOps feature support for Jenkins, CI/CD and automation are not included in the preview version. Install MySQL 5.7. 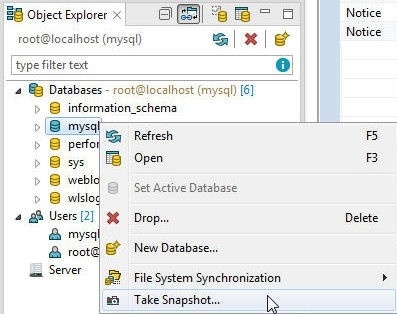 Start the MySQL CLI and list the databases with the show databases command, as we would need to provide a database name when connecting to MySQL from Toad Edge. Create an AWS account at https://aws.amazon.com/resources/create-account/ to use AWS RDS MySQL. After downloading the binaries for Toad Edge Preview 1.0, double-click on ToadEdge_1.0_x64_En_Preview.msi and click on Run in Open File. The Toad Edge Setup wizard gets launched. Click on Next as shown in Figure 1. Accept the End-User License Agreement and click on Next. 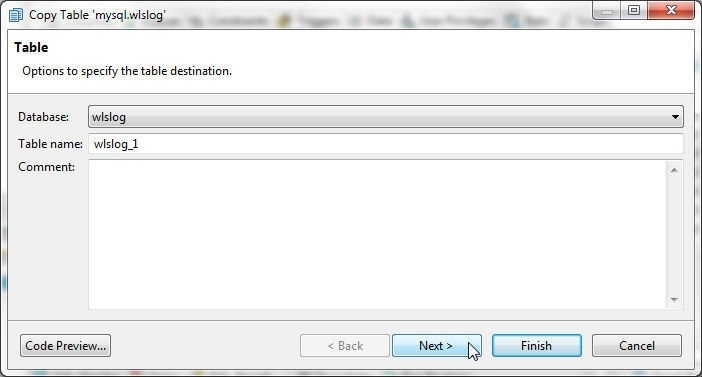 Select a destination folder to install Toad Edge and click on Next. Click on Install to start installation. The Installing Toad Edge dialog displays for a few minutes while the software gets installed. When the installation has completed click on Finish. Select the Toad Edge icon to launch the toolset. 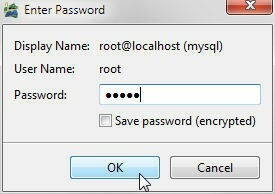 If a connection had been previously configured with MySQL database an Enter Password dialog gets displayed as shown in Figure 2. Provide the Password and click on OK. The Toad Edge toolset gets launched after verifying connection. The Toad Edge graphical user interface gets launched, as shown in Figure 3. 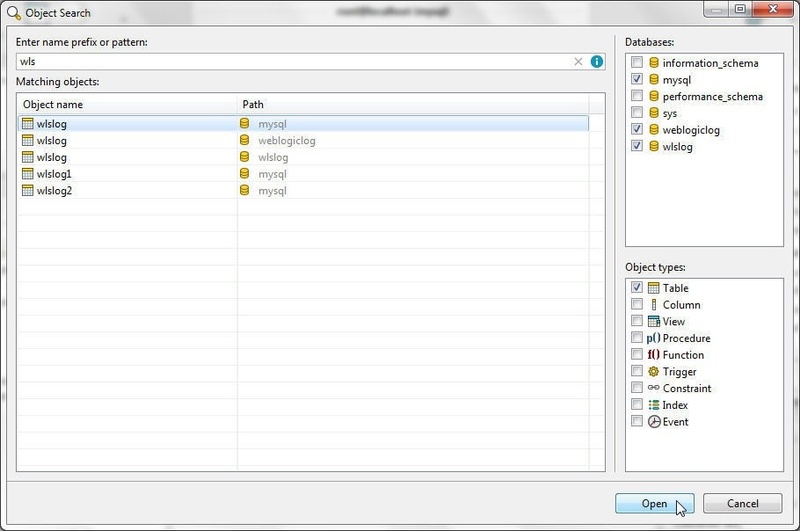 Toad Edge provides several Views of which Connections, Object Explorer, and Outline are open by default. All the different Views may be opened from View, as shown in Figure 4. 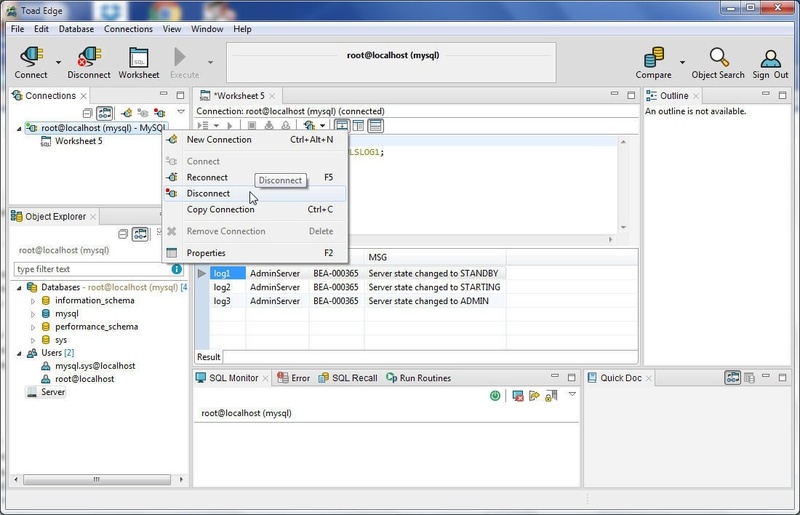 To connect to MySQL database, click on Connect in the toolbar and select New Connection, as shown in Figure 5. 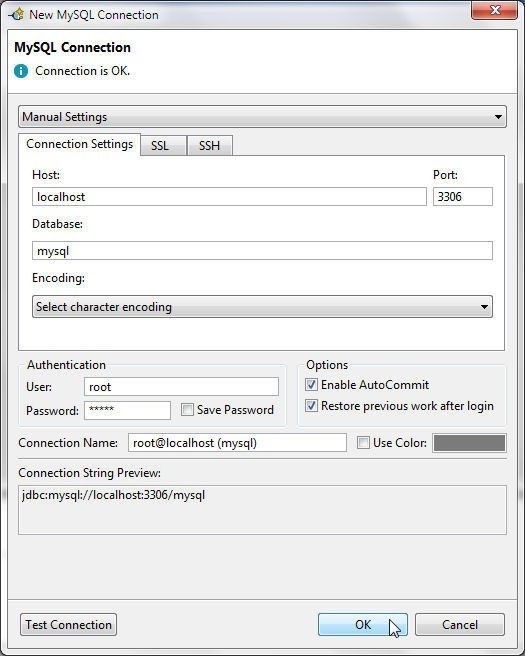 In the New MySQL Connection dialog three tabs are provided to specify the connection parameters: Connection Settings, SSL and SSH. 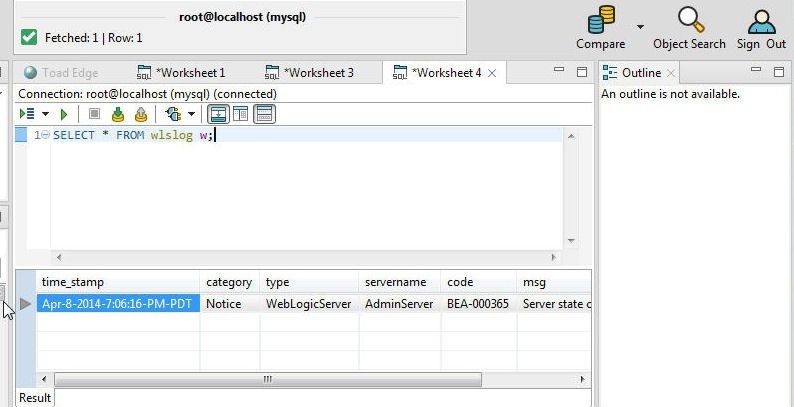 In Connection Settings specify Host (localhost), Database (mysql), User (root) and Password, as shown in Figure 6. The Options Enable AutoCommit and Restore previous work after login are selected by default. We shall be demonstrating committing a transaction with AutoCommit Off,for which the Enable AutoCommit should be de-selected. The Connection Name, which gets auto-generated, must be unique. Connection String Preview lists the connection URL. Click on Test Connection and if the message is “Connection is OK” click on OK.
A new connection gets created and gets listed in Connections view as shown in Figure 7. 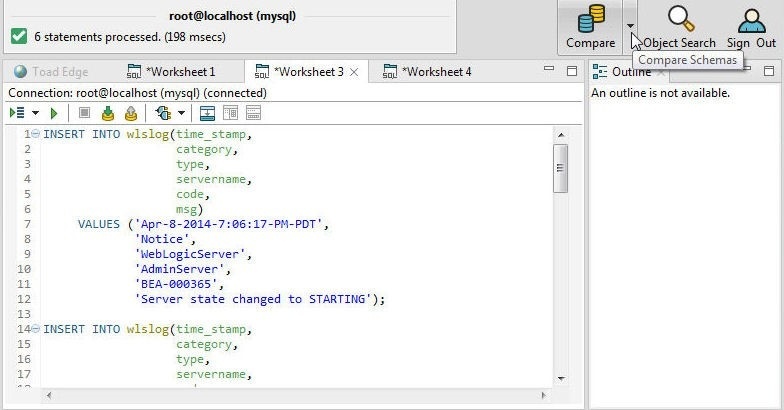 A SQL worksheet also gets added. If multiple connections are created one of the connections may be selected with Connect Selected, as shown in Figure 8. 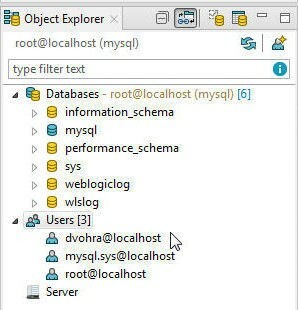 The Object Explorer view lists all the Databases and Users, as shown in Figure 9. The databases listed are information_Schema, mysql, performance_schema and sys with the active database shown in blue as mysql. 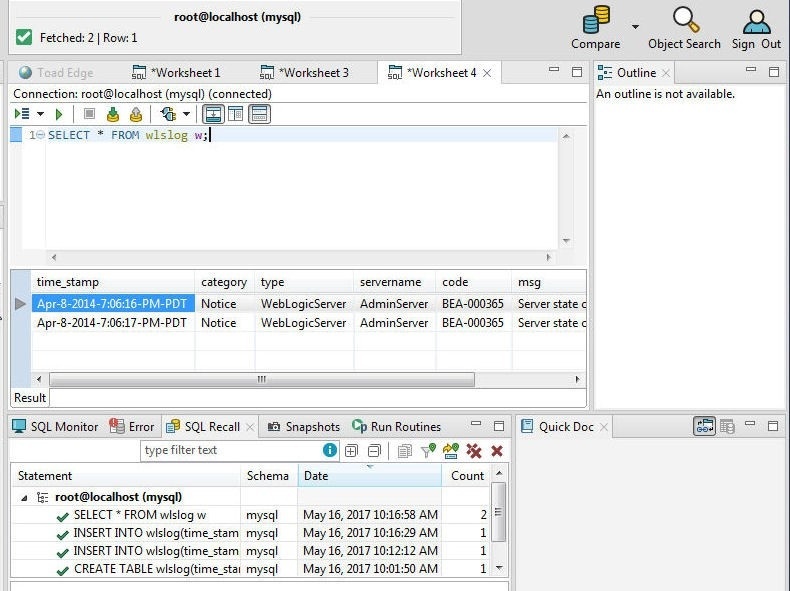 All the SQL statements run in a worksheet are run on the active database. 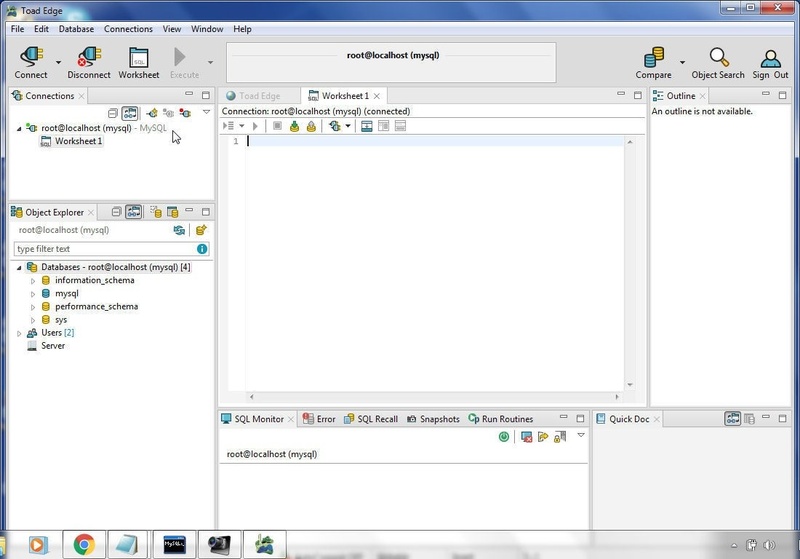 Setting active database is discussed in a later section. 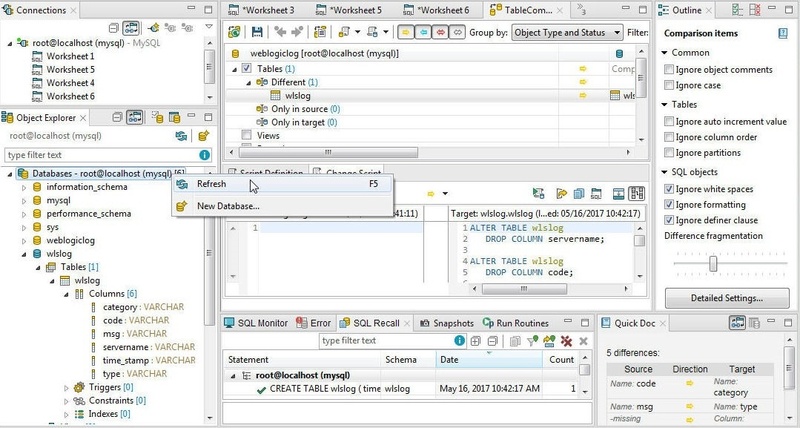 In this section we shall discuss creating a database table using the Worksheet1. Additional worksheets may be added by selecting Worksheet from the toolbar. 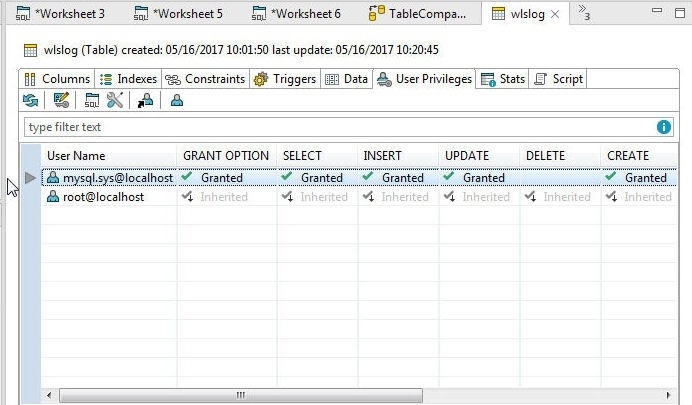 Specify the following CREATE TABLE SQL statement in the worksheet, as shown in Figure 10, below. 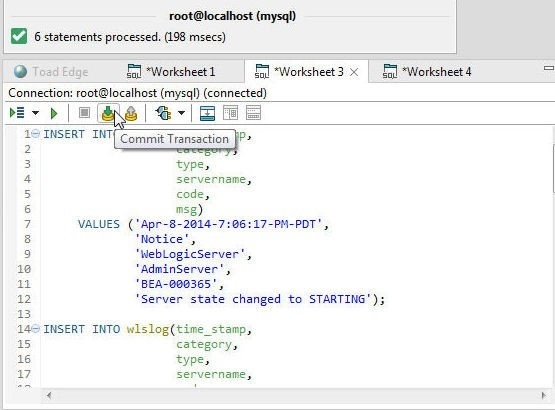 For DDL (Data definition language) statements such as CREATE TABLE we don’t need to commit the transaction with AutoCommit or by selecting Commit Transaction, since MySQL database implicitly commits the transaction after the statement is run. 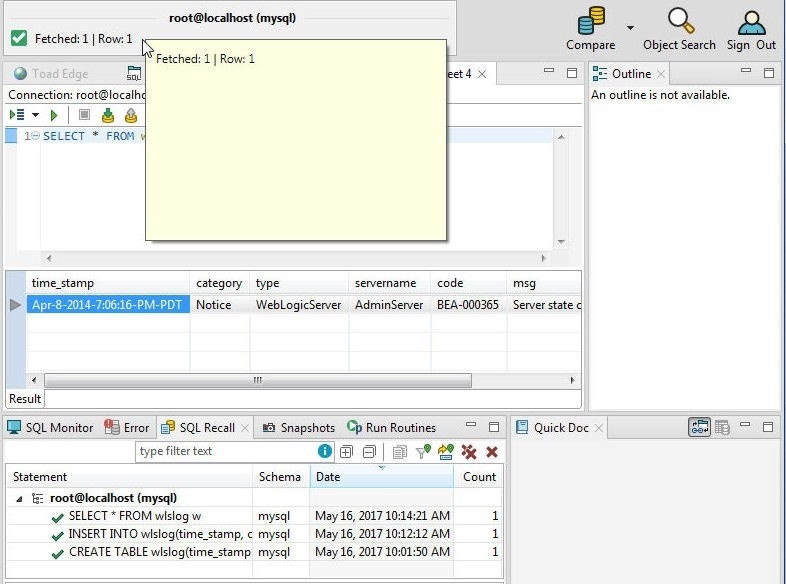 Click on Execute SQL Statement as shown in Figure 11. 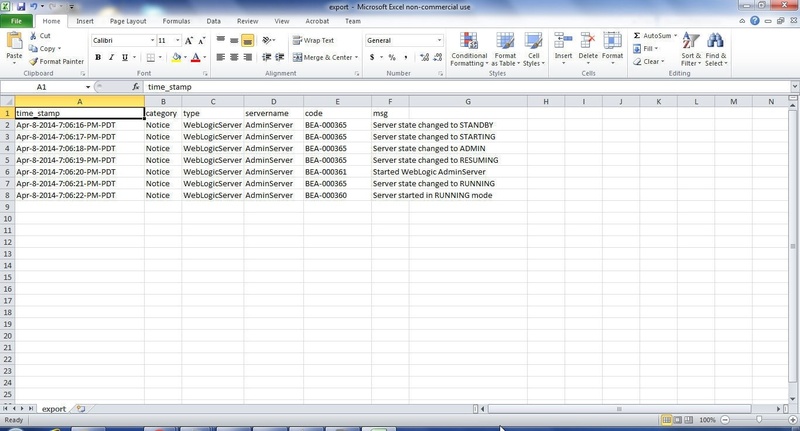 As the message Create table processed in Figure 12 indicates, a database table gets created. The AutoCommit Off setting shown below all the view tabs comes into significance when DML statements such as INSERT INTO are run. 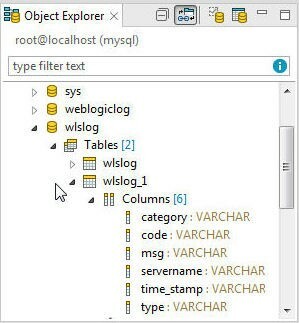 The wlslog table gets created in mysql database and gets listed in Object Explorer, as shown in Figure 13. 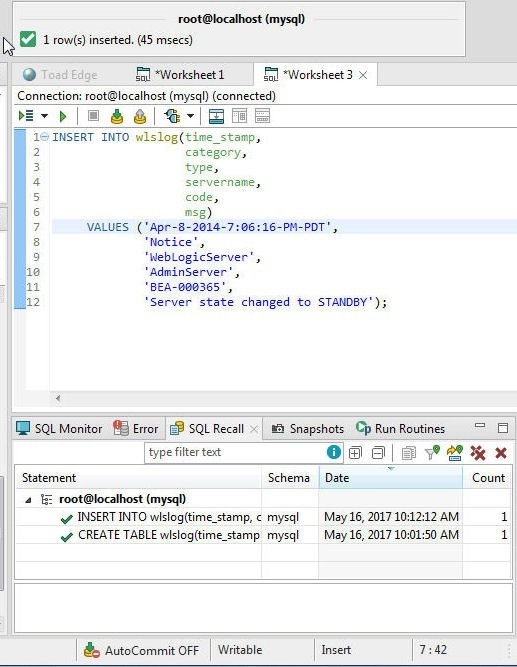 The SQL Recall view lists the CREATE TABLEstatement run. 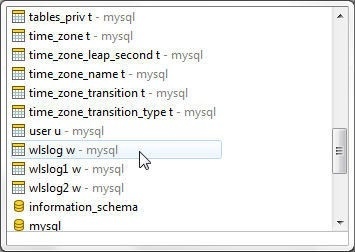 The MySQL CLI lists the wlslog table with the show tables command, as shown in Figure 14. Select the database with use mysql command before listing tables. 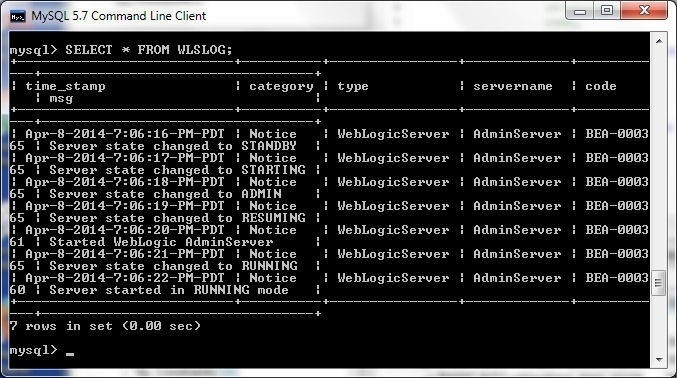 Next, we shall run DML SQL statements to add/update data to the wlslog table. 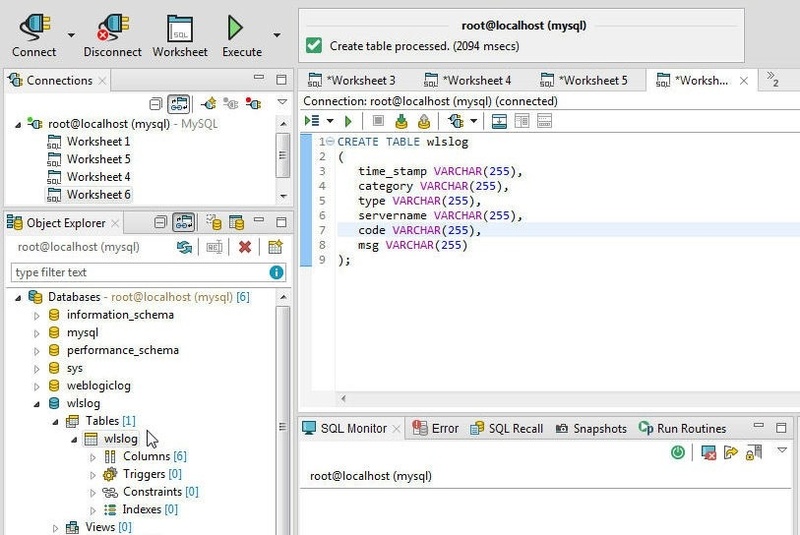 The INSERT INTO statement/s may be run in the same SQL Worksheet or a new Worksheet may be opened by selecting Open SQL Worksheet as shown in Figure 15. Add an INSERT INTO statement in the new Worksheet, as shown in Figure 16. 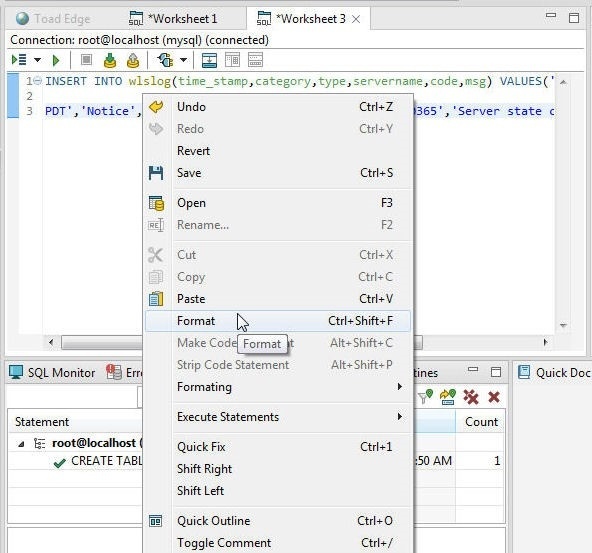 Right-click on the SQL Worksheet and select Format to format the SQL, also shown in Figure 16. Some additional formatting options are provided with Formatting as shown in Figure 17. 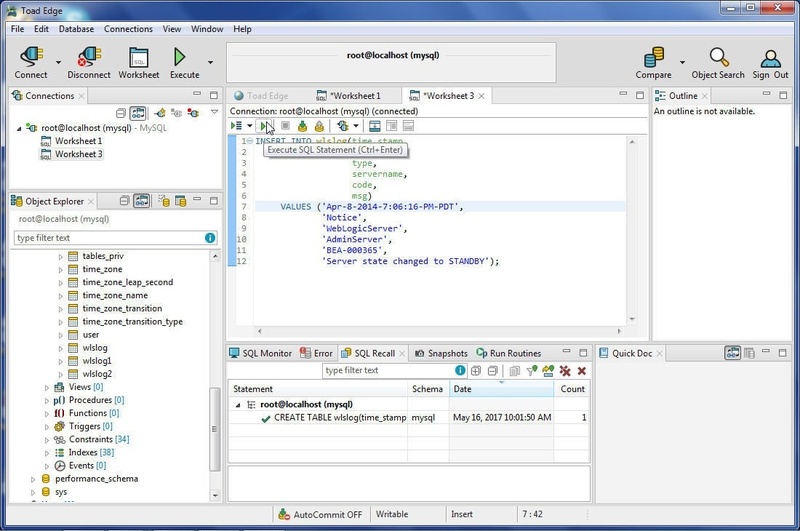 Click on Execute SQL Statement as shown in Figure 18 to run the DML statement. As the message in Figure 19 indicates, one row gets added. As the AutoCommit is Off, the transaction is not yet committed. 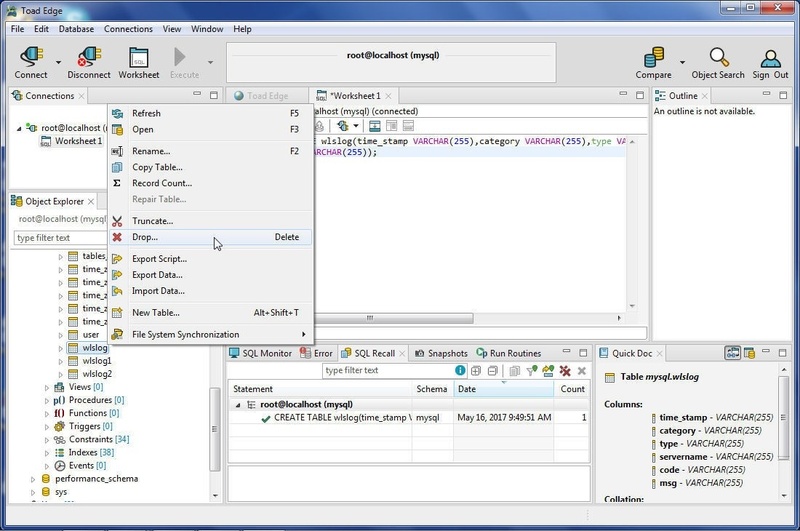 But the data added gets listed with a SQL query run from a Worksheet, as shown in Figure 20. 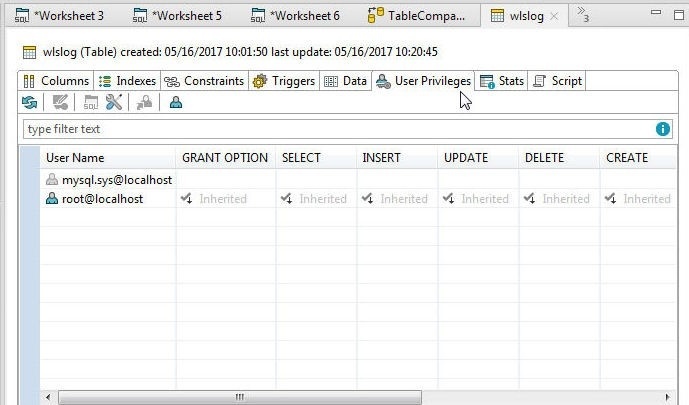 The INSERT INTO statement has run but not yet been committed to the database. 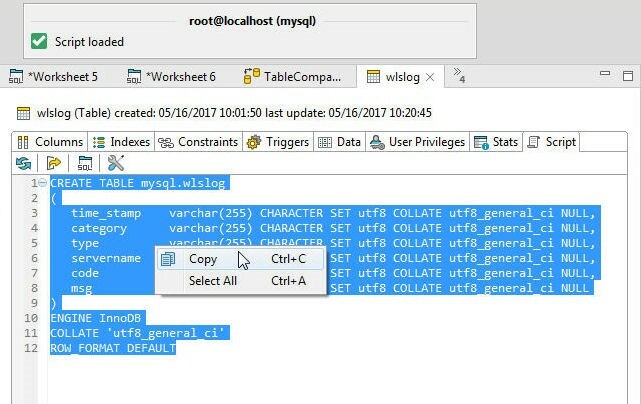 An SQL query on the wlslog table in MySQL CLI does not list any data, as shown in Figure 21. To commit the transaction click on Commit Transaction as shown in Figure 22. The transaction gets committed and a SQL query in MySQL CLI returns the data added, as shown in Figure 23. Next, we shall demonstrate rolling back a transaction; for which, run another INSERT INTO statement, as shown in Figure 24. 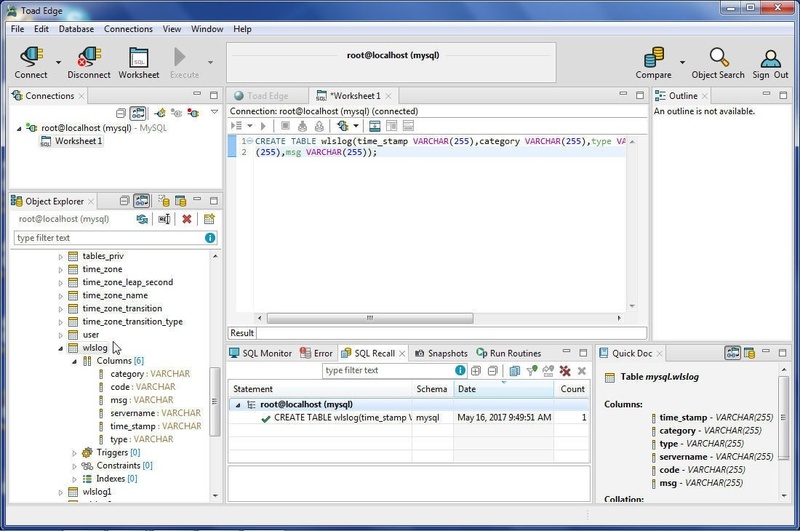 Run a SQL query in a Worksheet and two rows of data get returned, as shown in Figure 25. But the second transaction has not yet been committed. To roll back the second transaction, click on Rollback Transaction as shown in Figure 26. AutoCommit may be enabled by selecting Database>Enable AutoCommit, as shown in Figure 27. Next, we shall run multiple SQL statement in a single transaction. In a new Worksheet, add multiple INSERT INTO statements including the statement that was rolled back. 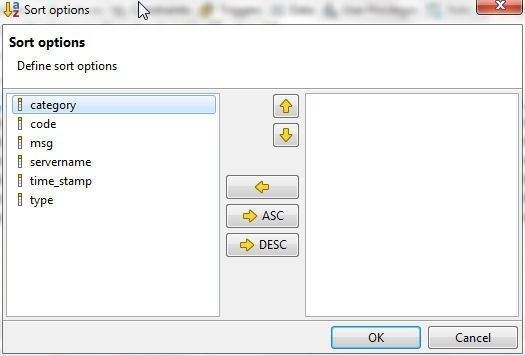 Click on the Execute All Statements and select from one of the options as shown in Figure 28. 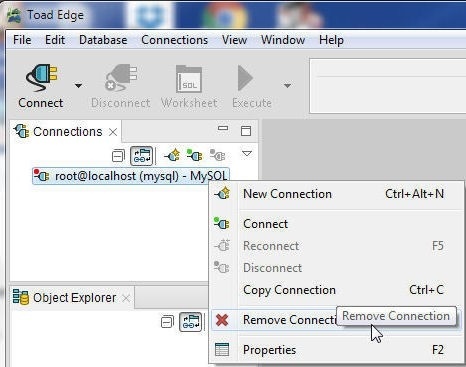 The unique feature of being able to Execute from Current Position and Execute to Current Position is available in Toad Edge. As the message in Figure 29 indicates, six statements get processed. 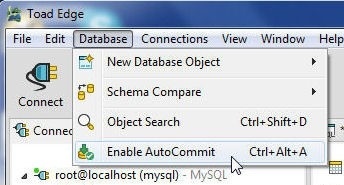 If AutoCommit is Off click on Commit Transaction. The MySQL CLI lists the newly added data, as shown in Figure 30. 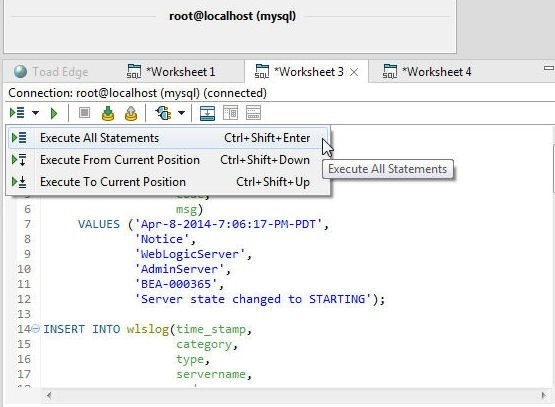 SQL Worksheet provides IntelliSense to auto-suggest SQL statement completion options. 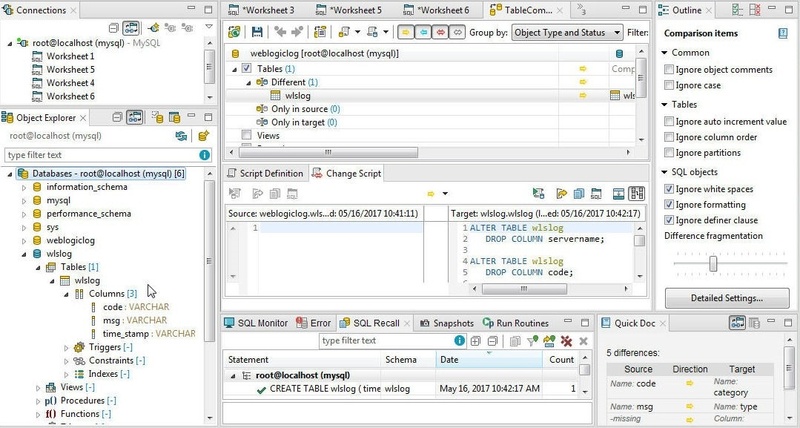 As an example, add SELECT in a worksheet, and options to add the subsequent SQL object or clause get listed, as shown in Figure 31. Select ‘*’ as an example. 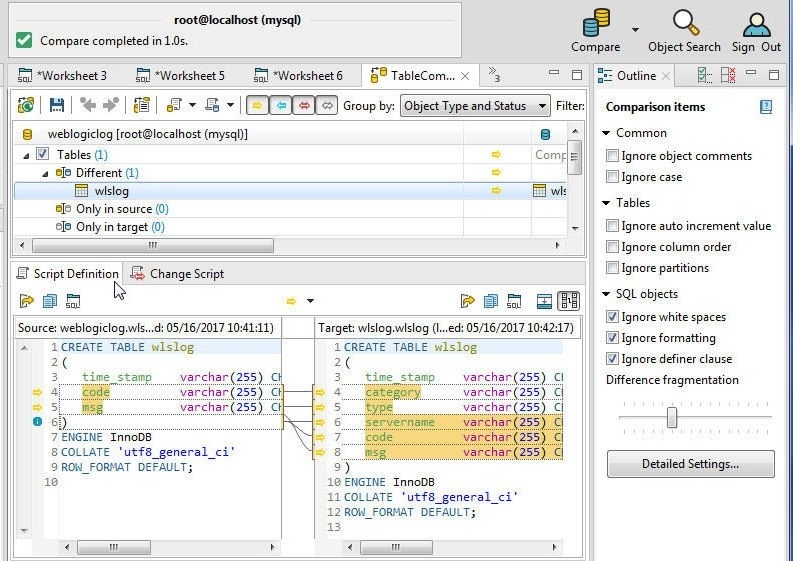 After SELECT * has been added Worksheet IntelliSense provides further options for SQL objects and clause to, as shown in Figure 32. Select FROM as an example. With further Worksheet IntelliSense, select a table (wlslog w) to query as shown in Figure 33. 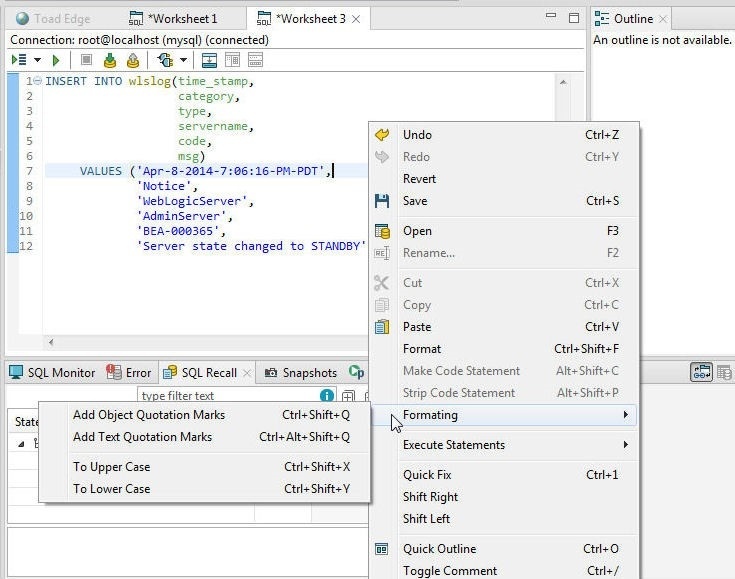 The complete SQL statement gets added using Worksheet IntelliSense, as shown in Figure 34. 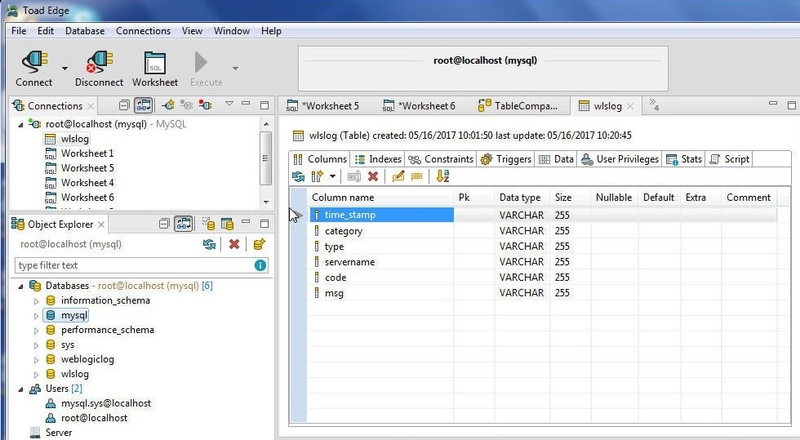 Run the SQL statement to return one row of data, as shown in Figure 35. 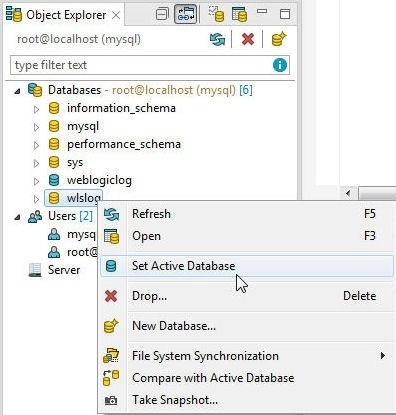 To create a new database, right-click on Databases in Object Explorer and select New Database as shown in Figure 36. 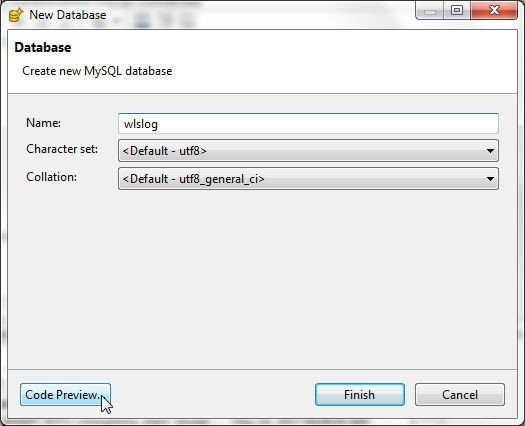 In the New Database dialog specify a database Name (wlslog) as shown in Figure 37. 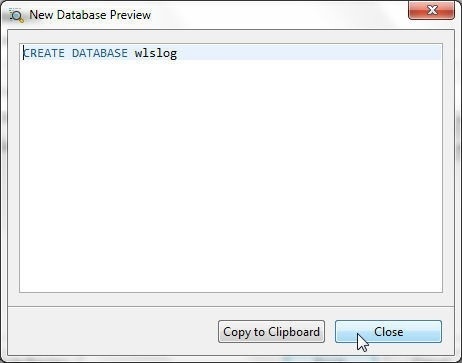 Click on Code Preview to preview the code used to create the new database. The New Database Preview lists the code used to create the new database, as shown in Figure 38. Click on Close to close the New Code preview. Click on Finish in the New Database to create the new database as shown in Figure 39. 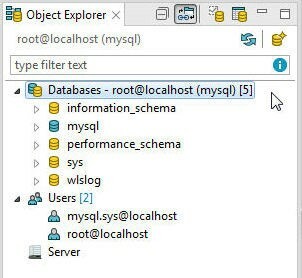 The new database wlslog gets created and gets added to Object Explorer, as shown in Figure 40. The active database is indicated in blue, the weblogiclog database is active in Figure 41. Only one database may be active at a time. 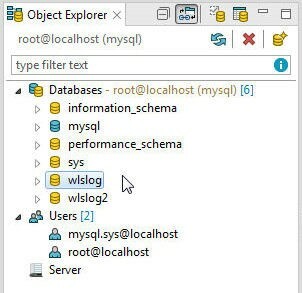 To make the wlslog database the active database, right-click on wlslog in Object Explorer and select Set Active Database as shown in Figure 41. 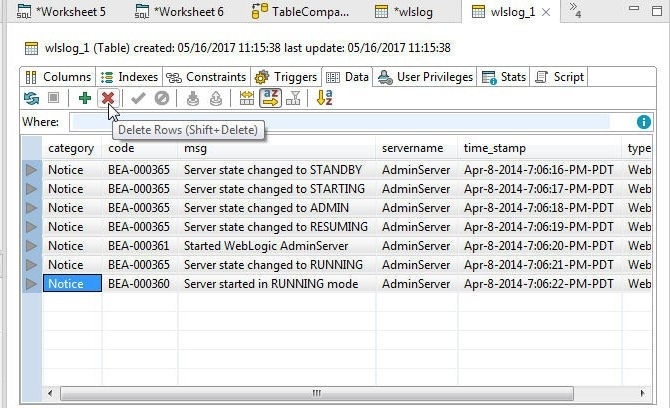 With the wlslog database as the active database, in a SQL Worksheet run a CREATE TABLE SQL statement to create a table, as shown in Figure 42. 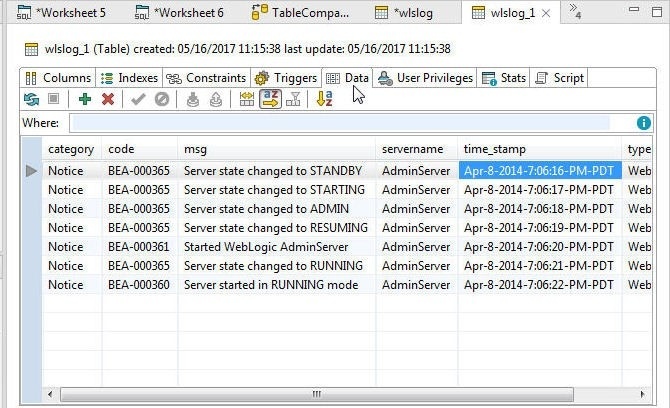 The wlslog table gets added to the active database wlslog, as shown in Figure 43. 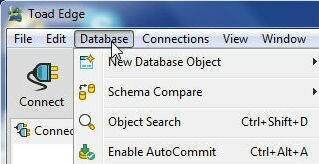 To drop a database, right-click on the database in the Object Explorer and select Drop as shown in Figure 44. Click on OK in a Confirm dialog. The database gets dropped. 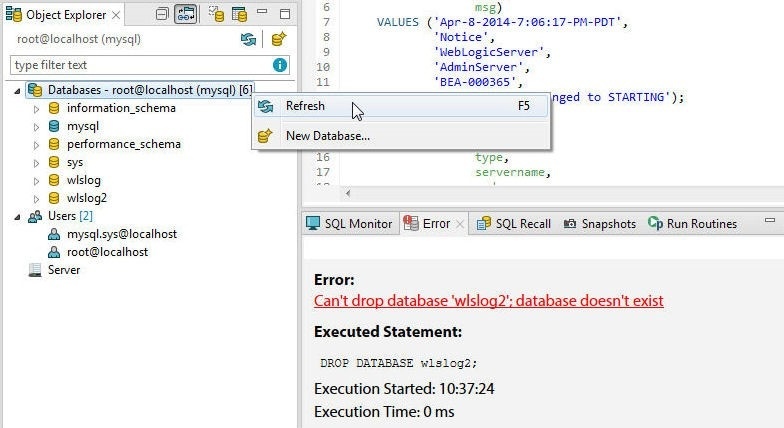 If the database did not exist before being dropped an error message gets displayed, as shown in Figure 45. 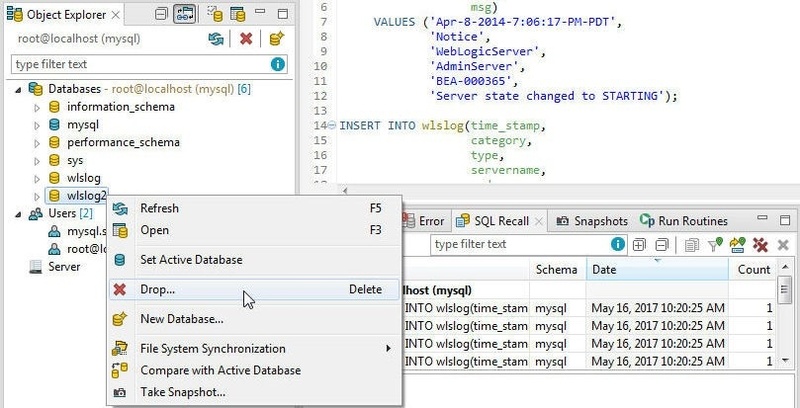 A database could not exist and still could be listed in Object Explorer>Databases if the database has been dropped on MySQL CLI since the previous time the Databases list was refreshed. To refresh the Databases list right-click on Databases and select Refresh as shown in Figure 46. 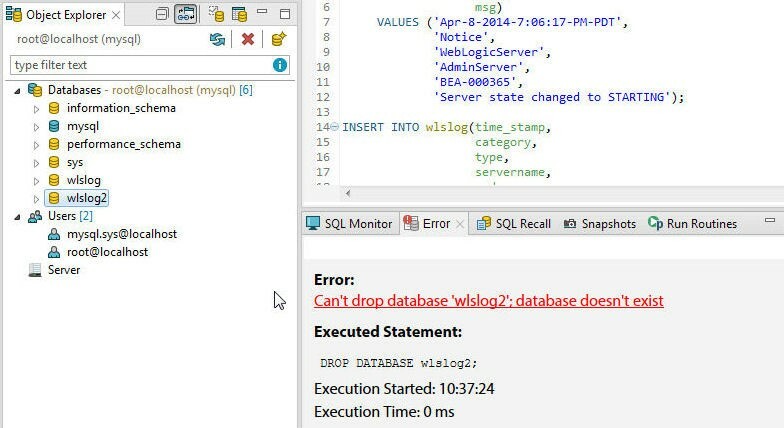 The Databases get refreshed and the wlslog2 database is removed, as shown in Figure 47. 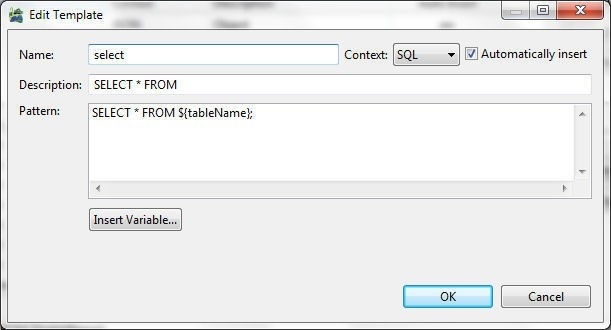 To drop a database table, right-click on the table in Object Explorer and select Drop as shown in Figure 48. Click on OK in a Confirm dialog. The wlslog table gets dropped and gets removed in Object Explorer, as shown in Figure 49. 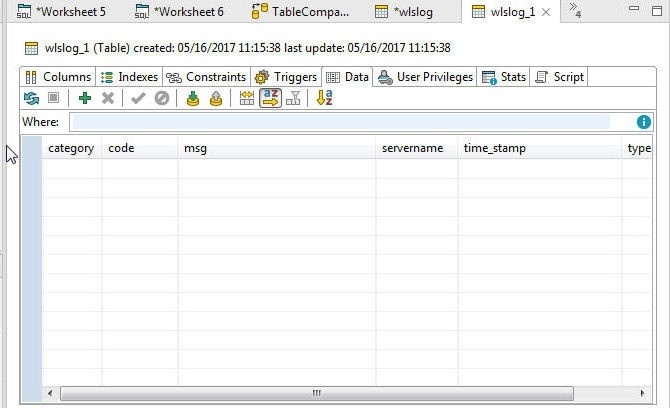 A table may also be dropped with the DROP TABLE SQL statement in a worksheet, as shown in Figure 50. 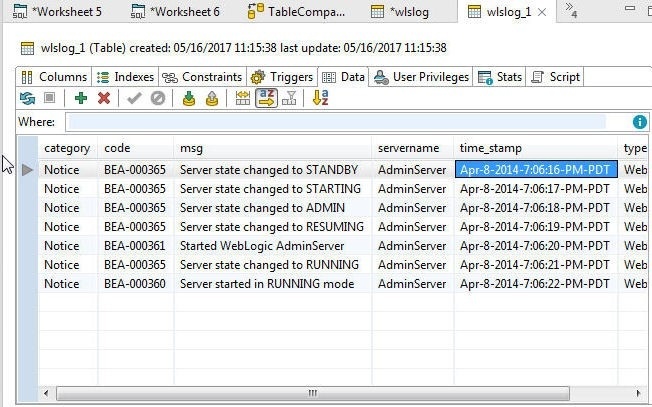 To copy a database table right-click on the table (wlslog) in Object Explorer and select Copy Table as shown in Figure 51. 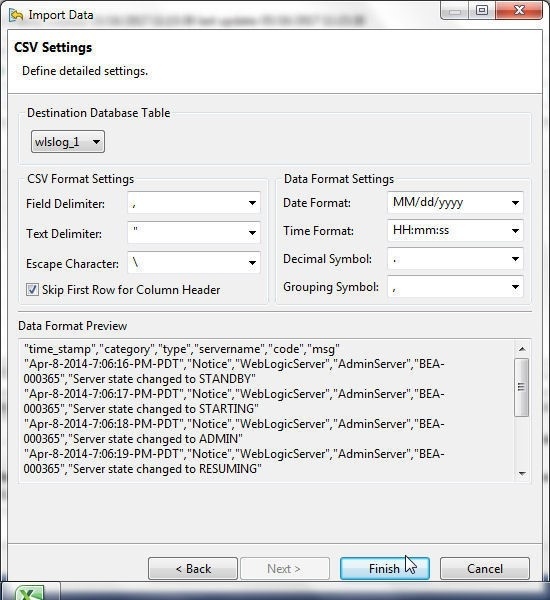 In the Copy Table dialog specify the table destination in terms of Database and table name as shown in Figure 52. Click on Next. In Table Columns select the columns to copy as shown in Figure 53. At least one column must be selected. As the Code Preview indicates in Figure 54, the Create Table as Select (CTAS) is used to copy the table. Click on Finish in Copy Table. Click on OK in confirmation prompt. 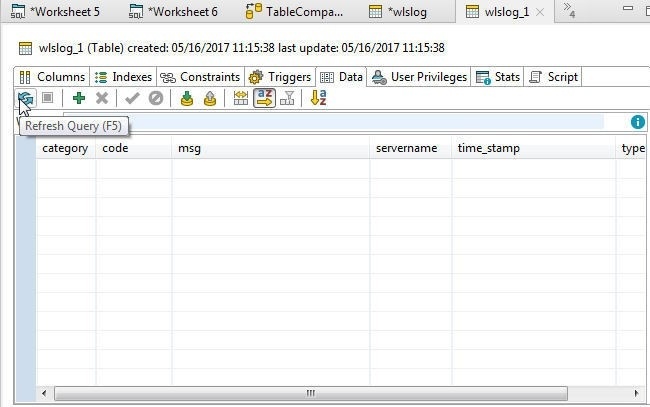 The wlslog table in mysql database gets copied to wlslog_1 table in wlslogdatabase, as shown in Object Explorer in Figure 55. The table data also gets copied when a table is copied, as shown in Figure 56. If only the table definition is required to be copied the table data may be deleted with Delete Rows, as shown in Figure 57. 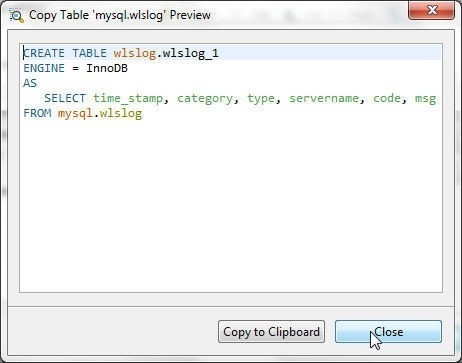 An empty table wlslog.wlslog_1 with same table definition as mysql.wlslog is shown in Figure 58. 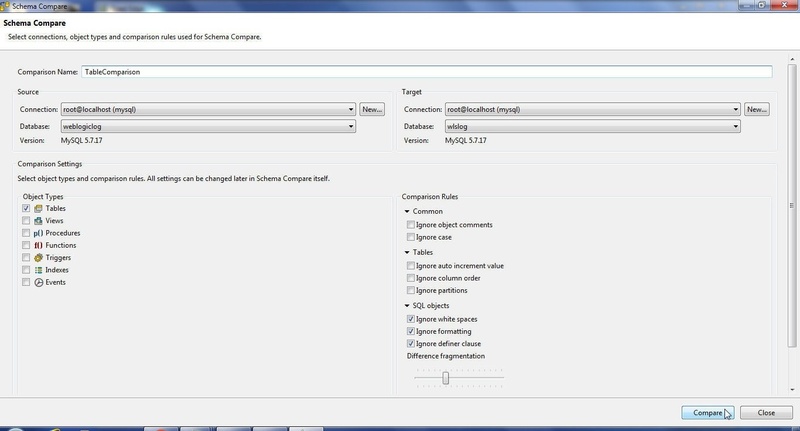 To compare table schemas the Compare Schemas feature is provided, as shown in Figure 59. Click on the Compare drop-down and select New as shown in Figure 60. To compare schemas the source and target databases should not be the same. 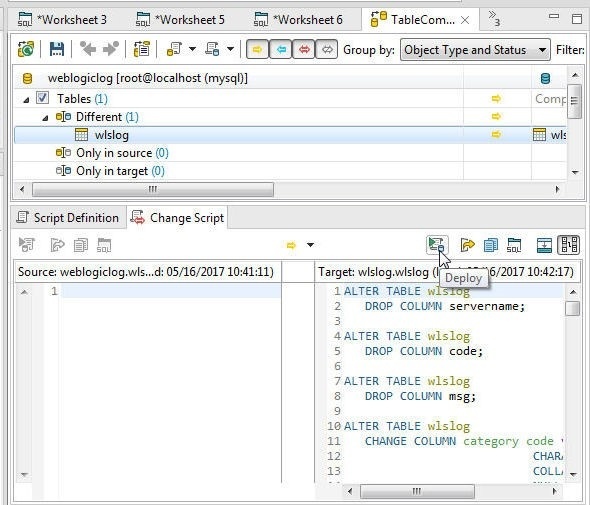 In Schema Compare, specify a Comparison Name and select a Sourcedatabase (weblogiclog) and a Target database (wlslog). In Comparison Settings select the Object Types (Tables). 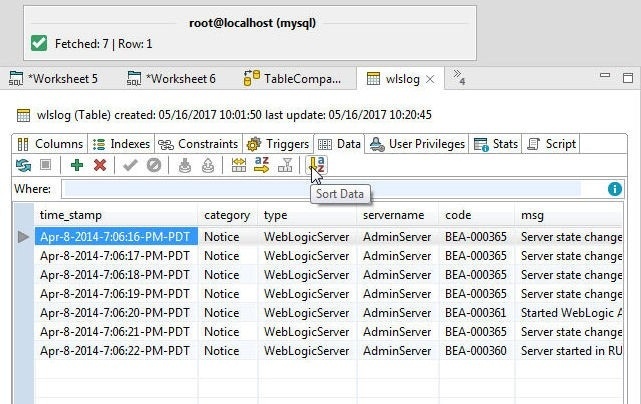 For the example comparison both the source and target databases have a single table wlslog. 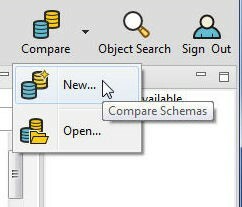 Select the Comparison Rules and SQL Objects and click on Compare as shown in Figure 61. The Compare gets completed, as indicated by the message in Figure 62. A Script Definition highlighting the differences in the schemas gets generated. 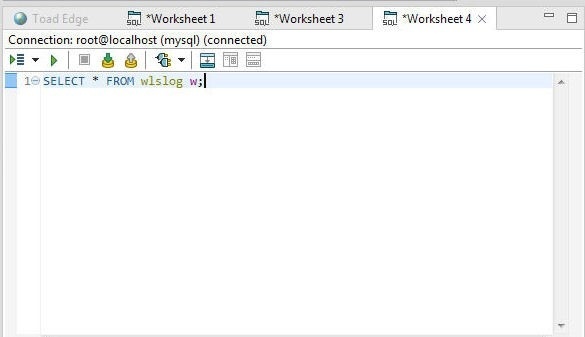 The script may be exported or imported in a SQL Worksheet. A Change Script also gets generated, as shown in Figure 63. 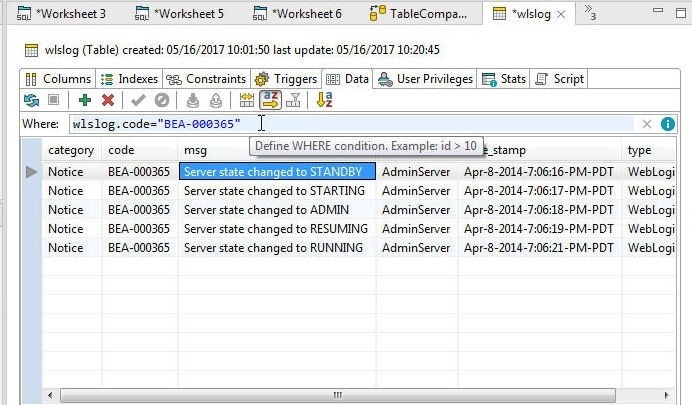 The Change Script is a SQL script to make the target table the same schema definition as the source table. 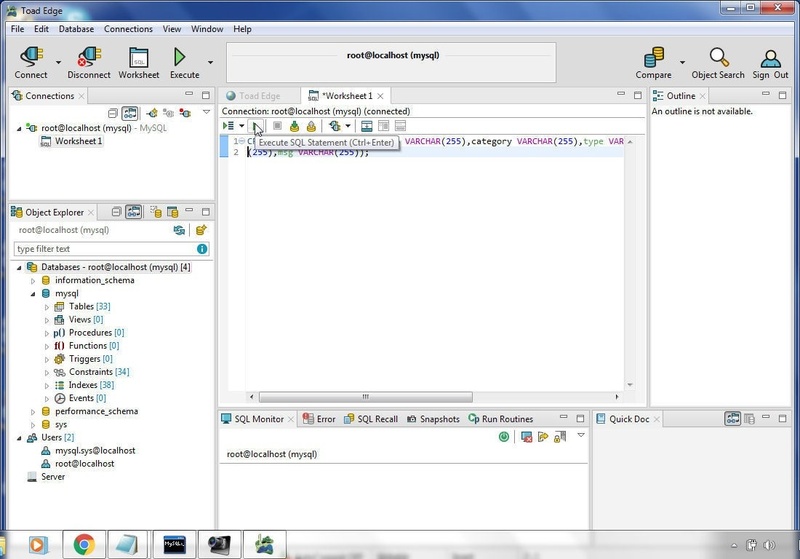 To apply or run the change script, click on Deploy as shown in figure 64. An Apply Differences dialog gets displayed and the target table is made the same as the source table. Click on Databases>Refresh to refresh the databases as shown in Figure 65. As shown in Figure 66, the target database table wlslog.wlslog has three columns instead of the six before applying the differences with the weblogiclog.wlslog table. 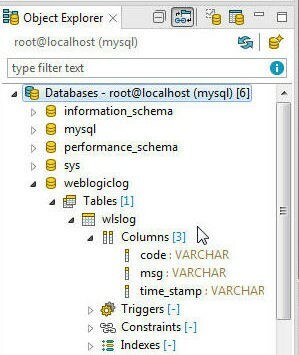 The database table columns for the Source database table weblogiclog.wlslog are shown in Figure 67. To search for database objects click on Object Search in the toolbar as shown in Figure 68. Alternatively, select Database>Object Search, as shown in Figure 69. In Object Search select the Databases to search and the Object Types to search for, as shown in Figure 70. Add a name prefix or pattern to search for and the objects get listed. The objective of an object search would be typically to open and use the object; for which, select an object from Matching Objects and click on Open as shown in Figure 71. The selected object gets opened, as shown in Figure 72. For a table, data may be sorted with Sort Data, as shown in Figure 73. In Sort Options define the sort options as shown in Figure 74 and click on OK. Some of the other features are Sort Columns Alphabetically, Resize Columns to Data, Insert Row, and display the Script for the table CREATE TABLE DDL, as shown in Figure 75. The script may be selected and copied with right-click>Select All and Copy. A WHERE condition may be specified to filter the result set, as shown in Figure 76. Table data may be exported or data may be imported into a table. To export table data right-click on the table in the Object Explorer and select Export Data as shown in Figure 77. 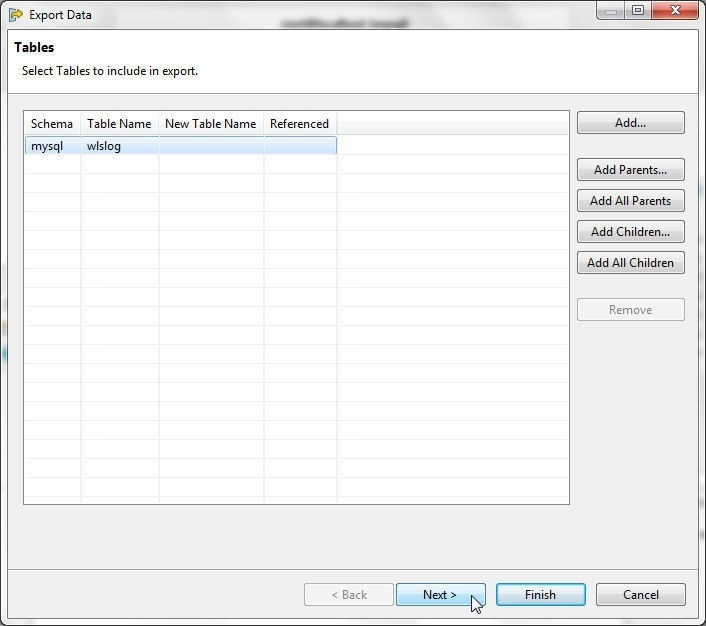 In the Export Data dialog select tables to include in the export and click on Next, as shown in Figure 78. In Destination and Format select Export As format as CSV to generate a Spreadsheet, as shown in Figure 79. 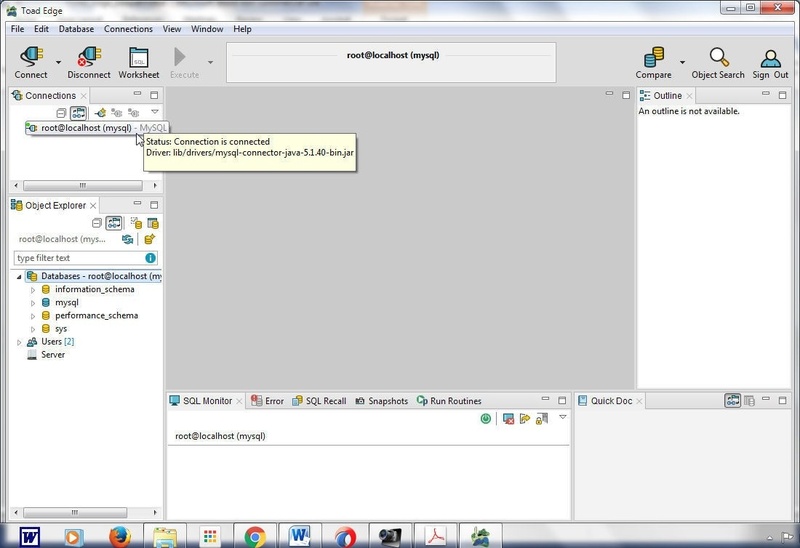 Select Destination for Exported Data as a Single File to export to a file. Provision to export to separate files if multiple tables are selected for export is available. In Settings select Compress File in Zip Format to export to a Zip file. 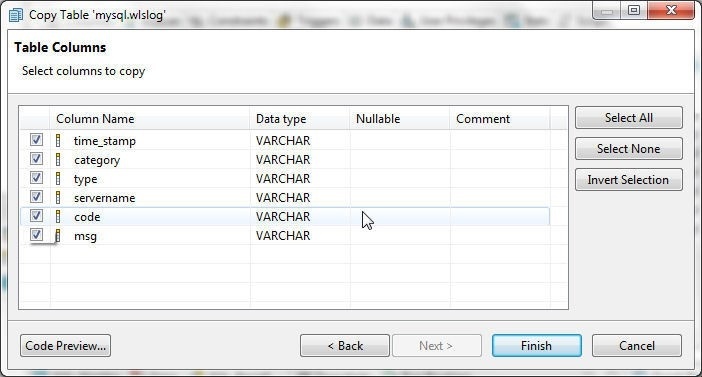 In Exclude Data Types select the data types to exclude from export, as shown in Figure 80. 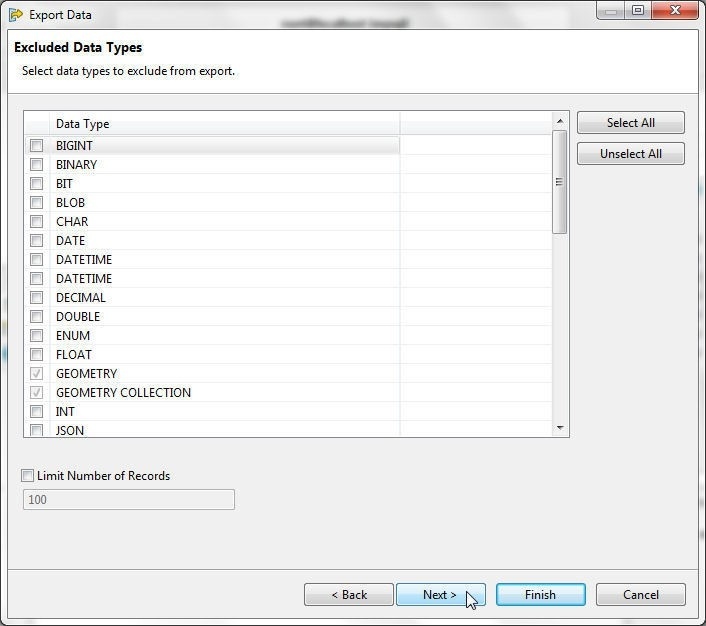 The GEOMETRY AND GEOMETRY COLLECTION data types are excluded by default for export to CSV. The number of records to export may be limited with Limit Number of Records. Click on Next. 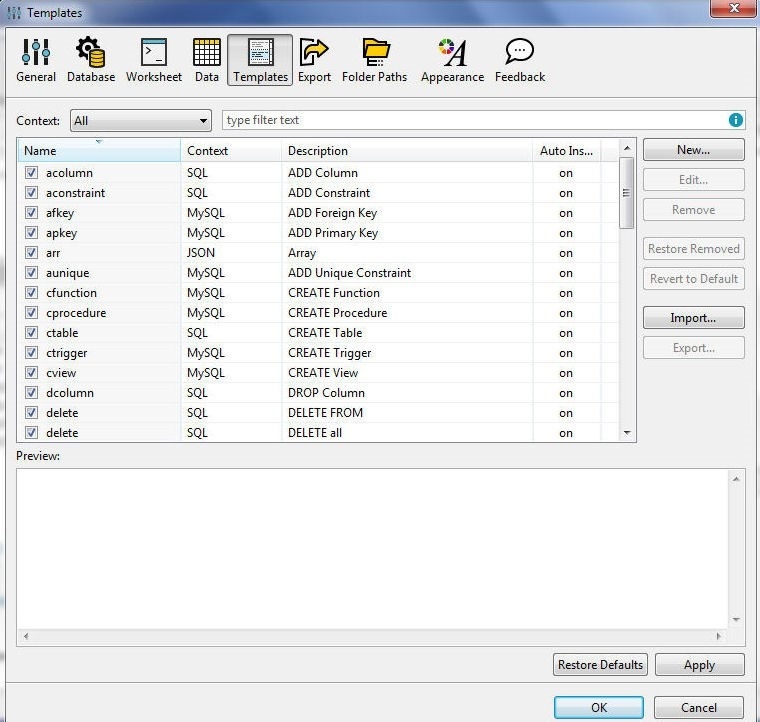 Select Columns to include in export and click on Next as shown in Figure 81. In CSV Settings the CSV Format Settings include Field Delimiter, Text Delimiter, and Escape Character as shown in Figure 82. Select Include Column Headers to include column headers in the exported data and select Numbers in Quotations option to quote numbers in exported data. The Data Format Preview lists the data that shall get exported. Click on Finish. 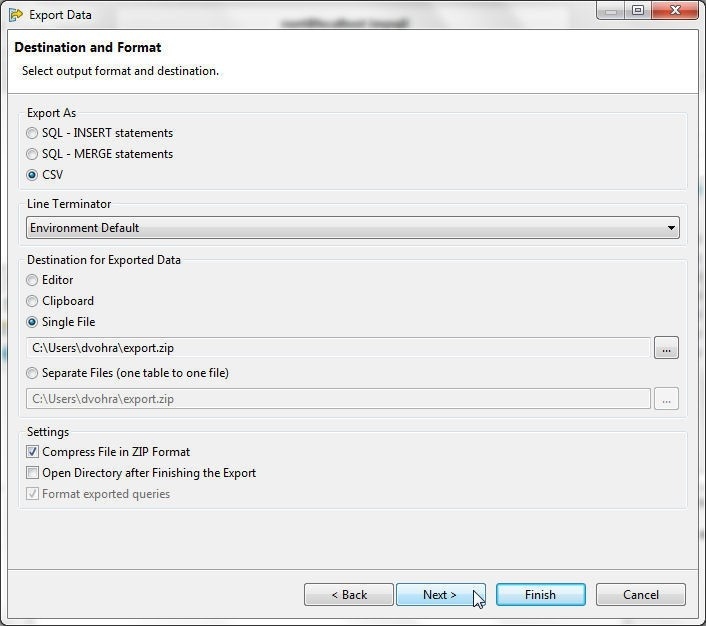 An Export Data finished dialog indicates that the data has been exported and also provides the file to which the data is exported, as shown in Figure 83. Click on OK. The exported Spreadsheet is shown in Figure 84. 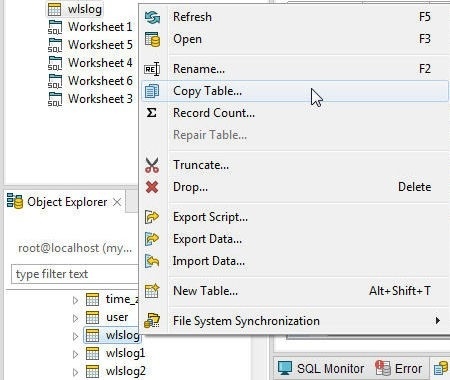 To import data select an empty table (wlslog_1, which was copied from wlslog and data deleted) in Object Explorer, right-click on the table and select Import Data as shown in Figure 85. 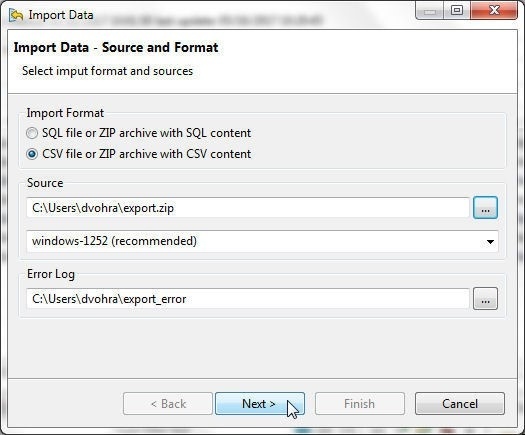 In Import Data dialog select an Import Format (CSV file or Zip archive with CSV) and select a data file to import, as shown in Figure 88. Select the same data file export.zip that was exported previously. The number of columns in the CSV file imported must match the number of columns in the table. Click on Next. 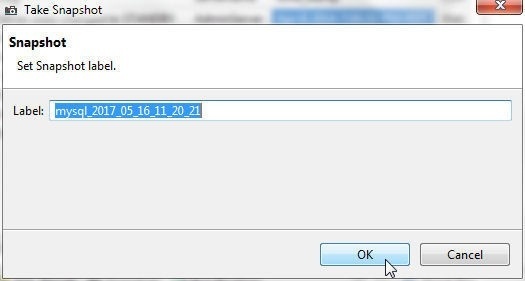 In CSV Settings click on Finish as shown in Figure 87. 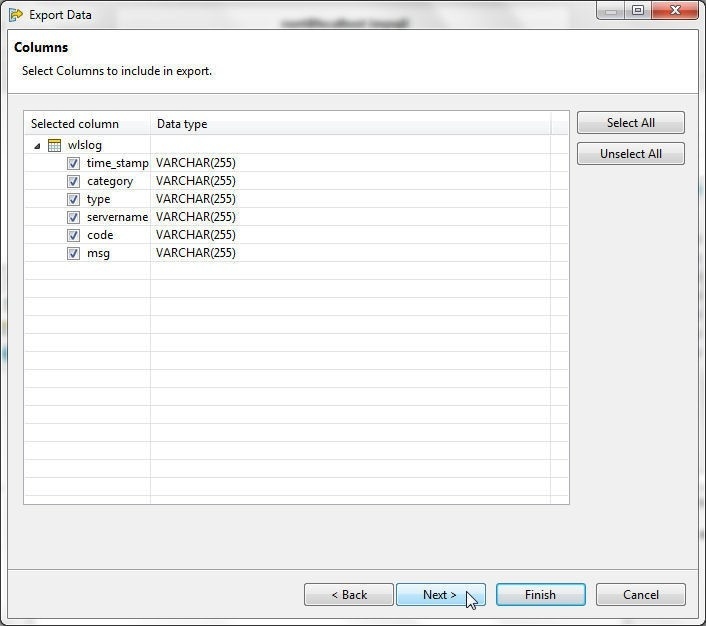 When the data import completes, the Data Import Result dialog displays a message to indicate the same and also includes an option to refresh table data, as shown in Figure 88. 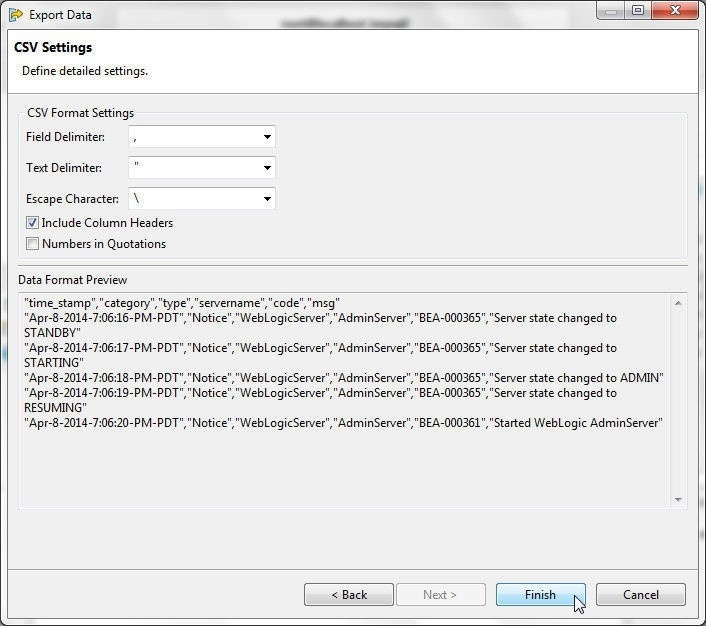 In the table wlslog_1 to which data is imported click on Refresh Query to list the imported data as shown in Figure 89. 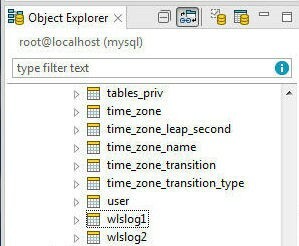 The data imported into the previously empty table wlslog_1 gets displayed, as shown in Figure 90. The User Privileges tab lists the user privileges for the different users. The root@localhost user has all the privileges granted as inherited as shown in Figure 91. 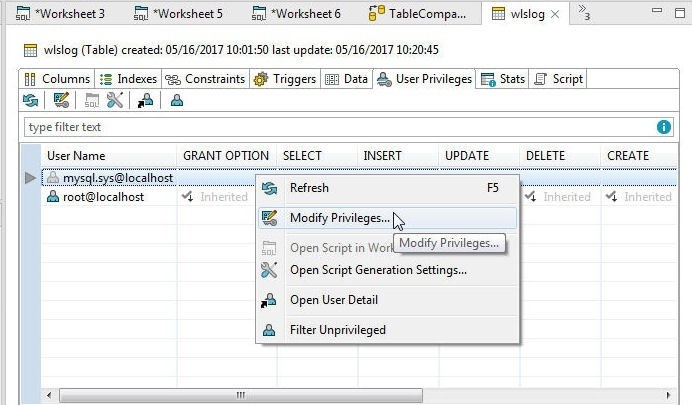 To modify user privileges for another user right-click on the user and select Modify Privileges as shown in Figure 92. In Edit Table Privileges select the privileges to grant and click on OK, as shown in Figure 93. The user privileges get granted, as shown in Figure 94. To create a new user right-click on Users and select New User as shown in Figure 95. 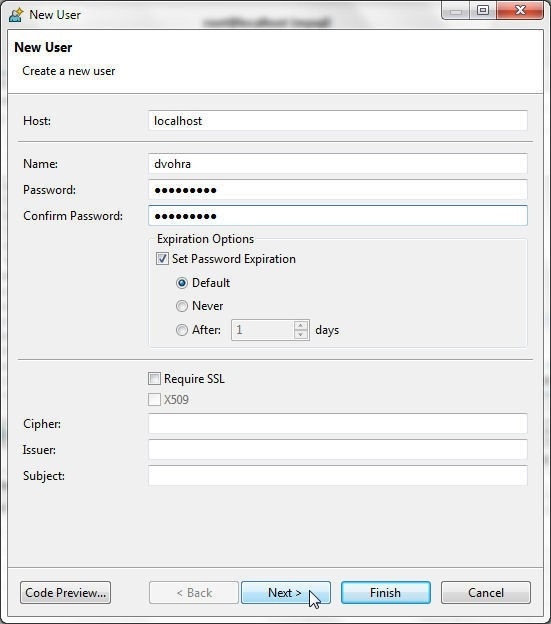 In New User specify Host, user Name and Password and click on Next as shown in Figure 96. 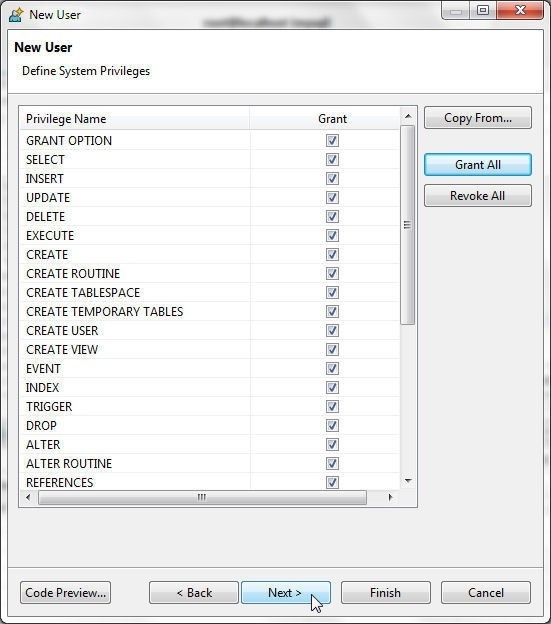 In Define System Privileges click on Grant All to grant all system privileges and click on Next as shown in Figure 97. In Limitations select the default settings and click on Finish. A new user gets added, as shown in Figure 98. A database snapshot may be used to back up a database. 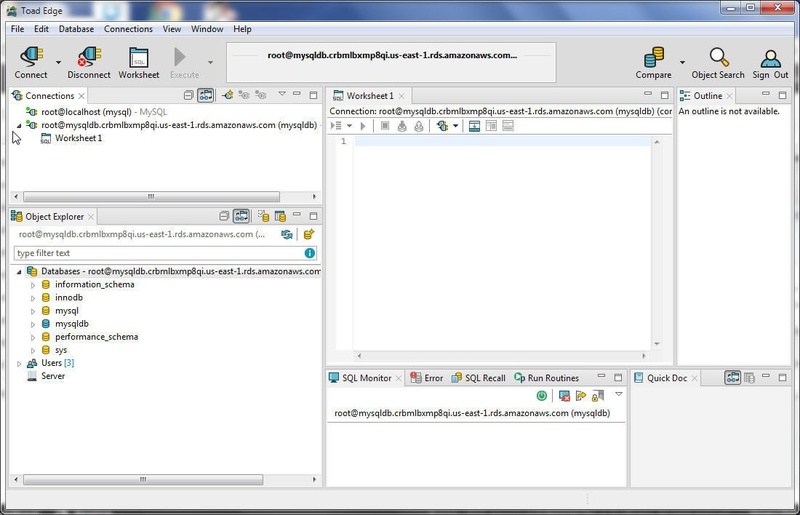 To create a snapshot right-click on a database and select Take Snapshot as shown in Figure 99. In Take Snapshot specify a snapshot Label and click on OK as shown in Figure 100. A new snapshot gets created. The Snapshots tab or view lists all the snapshots, as shown in Figure 101. A snapshot may be exported with Export Snapshot, as shown in Figure 102. Specify a JSON file name in Save As and click on Save. An exported snapshot JSON file is shown in Figure 103. An SQL script may be generated from a snapshot with Generate Script>Generate Script to File, as shown in Figure 104. In Save As specify a File name and click on Save. 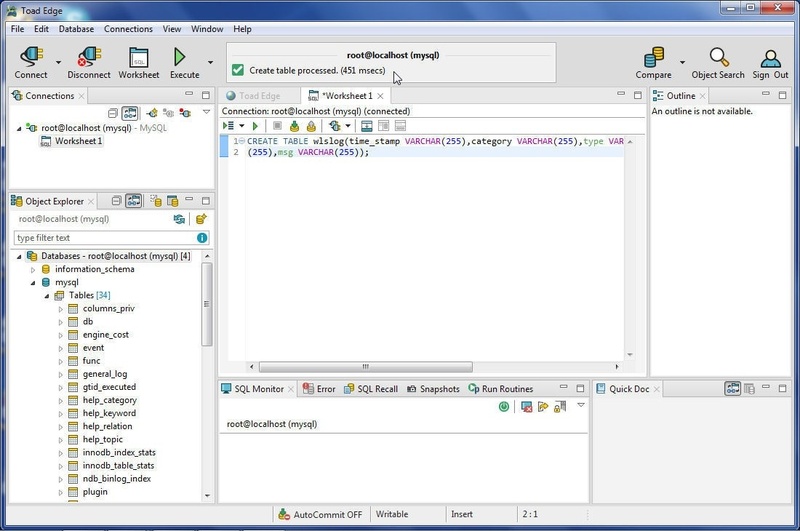 A SQL script gets generated from the Snapshot, as shown in Figure 105. The SQL Worksheet IntelliSense discussed earlier is based on built-in templates. 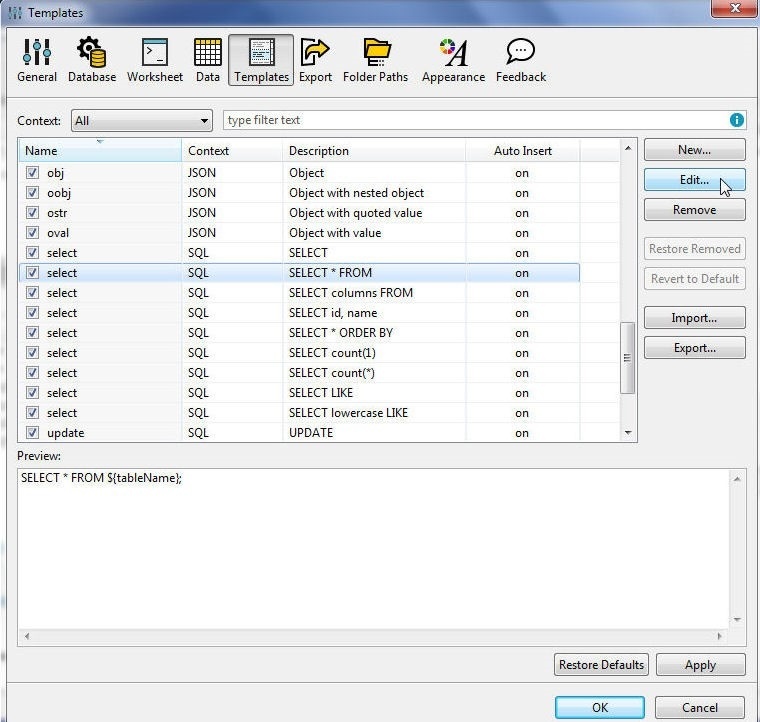 To explore or create a template, right-click in a SQL Worksheet and select Preferences. In Preferences select Templates as shown in Figure 106. Templates are based on patterns with variables as placeholders for the IntelliSense to be provided dynamically. The SELECT * FROM IntelliSense that we discussed earlier to auto-suggest table and other database objects is based on a template. Select the “select” template for the “SELECT * FROM” pattern and click on Edit as shown in Figure 107. The pattern, context and whether to automatically insert are shown in Figure 108. A new template may be created with New in Templates. 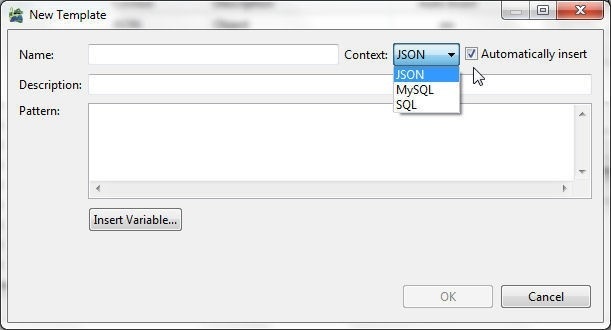 In the New Template select a Context from JSON, MySQL and SQL as shown in Figure 109. A Pattern may be specified using variables from Insert Variables. 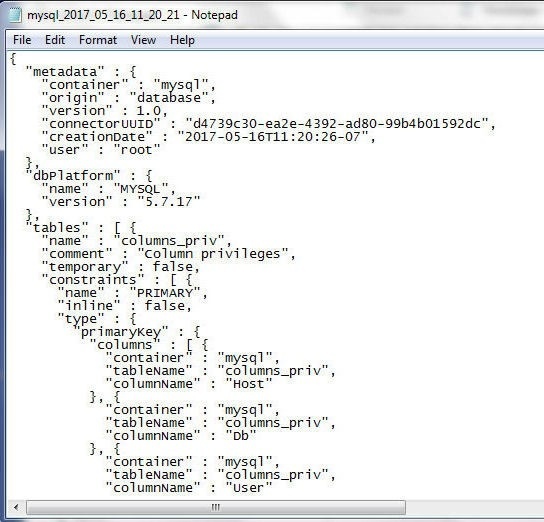 Toad Edge may be used to connect to manage not only a standalone MySQL database but also AWS RDS based MySQL database. 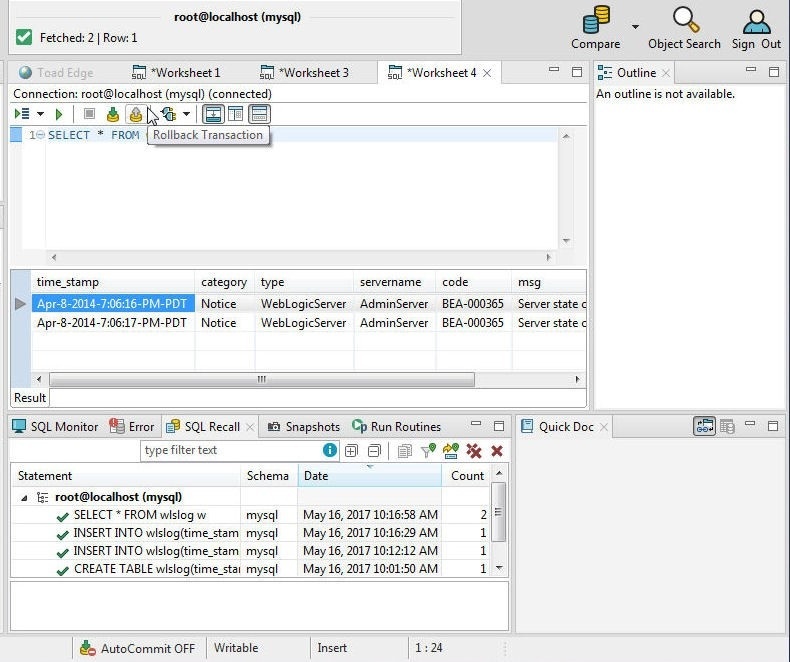 In this section we shall discuss connecting to RDS based MySQL database. 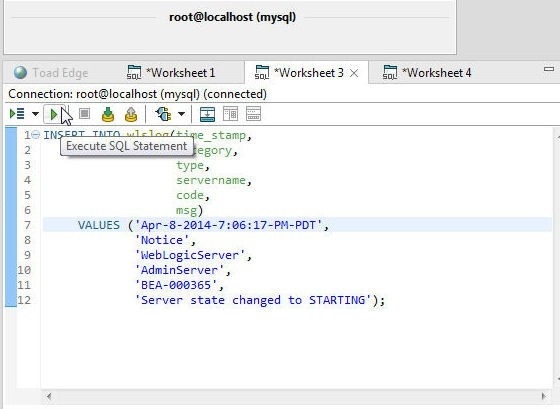 Create an RDS DB instance for MySQL database, as shown in RDS Console in Figure 110. 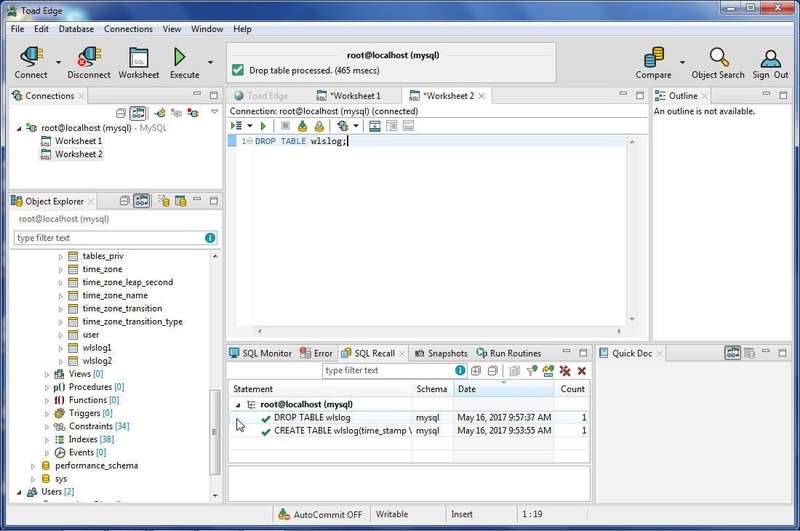 To connect to MySQL database, copy the Endpoint for MySQL instance from the RDS Console as shown in Figure 110. Click on Connect>New Connection in Toad Edge and in the New MySQL Connection specify the Endpoint without the Port number suffix (:3306) in the Host field as shown in Figure 111. Specify the port separately in the Port field. In the Database field specify the RDS DB Instance. Specify User and Password used to create the RDS DB instance and click on OK.
A new connection gets added to the Connections view, as shown in Figure 112. To disconnect a database connection, right-click on the connection in Connections and select Disconnect as shown in Figure 113. Alternatively, select the connection in Connections and click on Disconnect Selected as shown in Figure 114. A disconnected connection may be connected to again by selecting Connect in the same option list in which Disconnect is selected. To remove a connection select Remove Connection as shown in Figure 115. A connection must be disconnected before removing. Subsequently, click on OK in the Confirm dialog. A connection that is already connected may be reconnected with Reconnect, as shown in Figure 116. In this article we discussed the Toad Edge management toolset designed for open source databases with initial support for MySQL database.